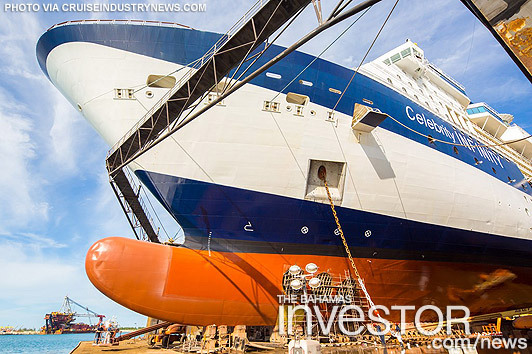 Grand Bahama Shipyard Limited announced it has completed work on 20 cruise ships in 2016, and has bookings for at least 23 in 2017 for various refurbishment jobs. Jobs in 2016 included significant propulsion and technical systems overhauls, hull treatment, accommodations and public spaces upgrades and the addition of onboard facilities, according to a prepared statement. In 2016, the first ship to drydock was the Maasdam, which was followed by fellow Holland America vessels Veendam in March and Prinsendam in May. Work including scrubber installations, thruster overhauls and hull coatings. Royal Caribbean drydocked various ships this year at Grand Bahama, including the Liberty, Adventure and Jewel, in addition to the Azamara Journey and Celebrity Summit. The largest cruise company by capacity in the Caribbean, Carnival Cruise Line, drydocked seven ships at Grand Bahama. P&O Cruises’ Adonia was converted from the P&O brand to Fathom at the drydock earlier in the year. There were more ships too, as Princess drydocked the Coral Princess in Freeport, where the ship received a number of updates as well as a new scrubber. From Norwegian, the Dawn spent 27 days in drydock with complete hull and topside treatment, stabilizers overhaul and Azipod repairs, according to a statement. Another first-time visitor was the MSC Divina, which drydocked in September. This is an excerpt from Cruise Industry News as it appeared on February 1, 2017. For updates or to read the current version of this post in its entirety, please click here. Real estate broker Mario Carey announced this week that he has launched a full-fledged property management division that includes commercial property management.